their privileged upbringing and the protection of the navy. As descendents of the founders of the World Government the World Nobles are considered above reproach, and any attack on them will lead to the summoning of a Navy Admiral to punish the perpetrator. None of the pirates from the first half of the Grand Line stand a chance against an Admiral, so Hachi makes Luffy promise that whatever happens he must not attack the Nobles. However, with the Nobles hoping to buy a mermaid slave and attacking innocent people for little more than daring to move, will Luffy be able to keep his promise until they can track down the coating specialist? balance comedy and drama and to keep its identity even when covering quite heavy issues like human slavery, execution and murder. The strong characterisation sets up the Straw Hats as a force for good, overcoming their own personal tragedies and taking the experience as a driving force to change the world. It's this heart at the centre of the story that has made it so popular, and it's also the reason the series can move seamlessly between comedy and more serious storylines with such ease. 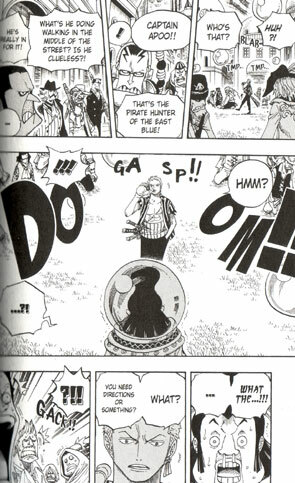 This volume is a case in point with the first part of the story seeing the Straw Hats attacked by the Flying Fish Riders and their mysterious master 'Iron Mask' Duvall. Duvall has a serious grudge against one of the Straw Hats for making his life a living hell, and the reason is one of the best comic twists the series has had in a while. There's even plenty of comedy and light-heartedness when the crew get to the Saboady Archipelago, with a trip to the Saboady Amusement Park and jokes about Zolo's awful sense of direction. However, there's action and drama too, with Luffy having to be physically restrained from attacking a World Noble who shoots a defenceless slave and the crew having to fend off bounty hunter attacks as they search for the coating specialist. We also get some explanation of the Archipelago itself and the other pirates who are there, with several new characters introduced including rival pirate captains Eustass Kid, Trafalgar Law, Capone Bege and Jewellery Bonney, and former pirates Shakky and Rayleigh. To be fair this volume feels like a mid-point between storylines, with a short comic storyline followed by plenty of setup for the next volume. We learn several new plot points which hint at future storylines, meet a host of new characters who will no doubt prove to be powerful opponents for the Straw Hats in future and learn more about the World Government and its hierarchy. This said, it's still damn good with strong artwork and a superb sense of imagination running throughout. 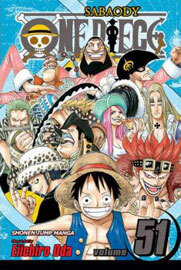 As always One Piece vol 51 is an entertaining read which is well worth repeated visits. There's plenty to enjoy and the comedy and action is tempered with some thought-provoking and quite dark plot strands concerning slavery and persecution. As always the balance between the various story elements is pitched perfectly and Oda never ceases to amaze me in how he can seamlessly re-introduce characters from 40-odd volumes ago or link current events into the past. This volume may just be set-up for a bigger storyline, but it's still excellent. The usual adverts and 'read right to left' notice grace the back of the book, and there's the 'story so far', character pictures and author's comment at the start. There's also more of the 'SBS' question corner pages where Oda answers reader questions alongside a colouring page featuring a line drawing of one of Oda's paintings to colour in and a page showing a rough storyboard image. The book is rounded off with the usual adverts and next volume preview. Overall, not a bad selection.